Remote Notification must be configured with settings for a valid SMTP Server in order to send the email alerts and reports. Presets are included for many common ISPs and email providers to facilitate quick and easy configuration. Required fields will be highlighted in red to make sure you know what needs to be configured for your ISP. If your ISP isn’t listed in the presets, Mozilla has a great list of SMTP settings for many ISPs that is used for configuration of their Thunderbird email client. Here is a description of each of the fields on the Send page of the Remote Notification Settings tab. Name: The name you would like displayed in the “From” field of the emails that you receive from your Home Server. Email Address: The email address that is associated with the SMTP Server you will be configuring to send the email messages through. SMTP Server Presets: Provides pre-configured settings for many common email providers and ISPs. If your provider is not listed, send us the details and we’ll update the list. Check for updated Presets: Download the most up-to-date presets file from the RemoteNotification.com website. If your ISP is not listed in the presets, try this button first to see if an updated presets file exists. Hostname: The name of the SMTP Server through which Remote Notification will send emails. Port: The port on the SMTP Server to which Remote Notification will connect to send emails. Use SSL: Check this box if the SMTP Server requires an SSL (or TLS) connection. 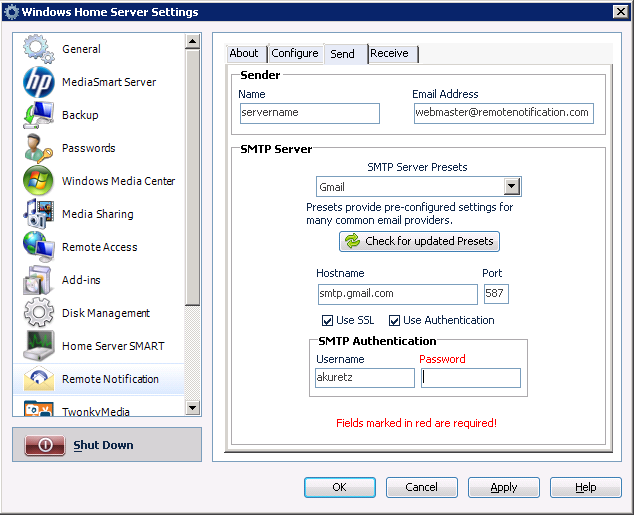 Use Authentication: Check this box if the SMTP Server requires authentication to send emails. SMTP Username: If authentication is required, the username to send when authenticating. SMTP Password: If authentication is required, the password to send when authenticating.